Bring a pan of water to the boil and cook the noodles according to the packet instructions. Drain, rinse briefly under water to prevent sticking and set aside. Meanwhile, heat the oil in wok or large frying pan on a high heat. Add the pork and stir fry for 5 minutes. Add the ginger, garlic, chilli and lemongrass and stir fry for another 1–2 minutes. Stir in the vegetables and cashew nuts and continue to stir fry for 3–5 minutes. The vegetables should be cooked but retain some ‘bite’. 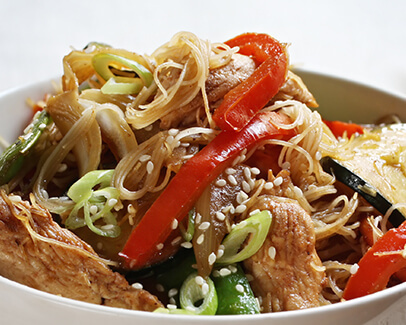 Combine the soy sauce, lemon juice and brown sugar in a separate container and mix with the stir fried vegetables. Finally, add the cooked noodles to the pan, mix well and serve. Suggestions: You can use any vegetables you like; good additions are baby corn, bamboo shoots and water chestnuts.